Mason City administrative offices are located at 10 First Street NW, Mason City, IA 50401; phone: 641-421-3600. Photo: Chris Rye House, ca. 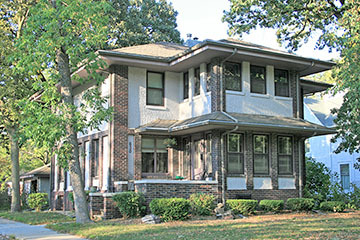 1913, 639 East State Street, Mason City, IA. Listed on the National Register of Historic Places in 1980. Photographed by user:Dan Breyfogle (own work), 2012, [cc-by-3.0 (creativecommons.org/licenses/by/3.0)], via Wikimedia Commons, accessed June, 2015. Mason City was platted in 1853 by John Long and George Brentner. A post office was established in 1857 and the following year Mason City was designated the seat of government for Cerro Gordo County. It was incorporated as a town in 1870. Mason City's  first industry began operation in 1855 when Elisha Randall built a lumber mill on Lime Creek; Randall also took advantage of the area's limestone outcroppings to produce lime. It was the 1869 arrival of the railroad that made all things possible for Mason City. The ability to distribute a product to a wide market significantly enhanced an industry's viability. By 1882 the first of Mason City's brick and tile plants opened. The company, later incorporated as Mason City Brick & Tile, began operations as a manufacturer of common brick and drain tile. In 1892, with a population of about 5,000, Mason City was the largest city in the northern one-third of the state. In the period between 1870 and 1892 the population had more than quadrupled. The 1892 publication "Mason City, Iowa Illustrated" described the population as a "stable & industrious laboring" one. The Mason City Commercial Club actively promoted their city to prospective industry. In addition to flowery descriptions extolling the virtues of Mason City as a livable community, the Club offered a five year tax exemption to any manufacturer investing $5,000 or more in capital. The Commercial Club often used promotional publications as a forum for describing the benefits of locating a business in Mason City. The 1896 "Mason City Through a Camera" described the city as offering "cheap and easy access to the raw material and a ready market for the manufactured article." Mason City's course toward becoming a major Iowa city picked up steam in the year 1900. By that time the railroad lines had established their routes; their presence firmly impacting the growth of the burgeoning community. Several major industrial interests were in place by this time, including J.E. Decker & Sons, which had opened a pork packing plant in 1899; Decker grew to become a powerhouse industry in Mason City. In addition to the Decker plant, two brick and tile plants were operating, capable of producing one-hundred thousand bricks every twenty-four hours. A third brick and tile plant was soon to open. Alexa McDowell, Architectural Historian, AKAY Consulting, Mason City Downtown Historic District, Cerro Gordo County, IA, nomination document, 2004, National Park Service, National Register of Historic Places, Washington, D.C.